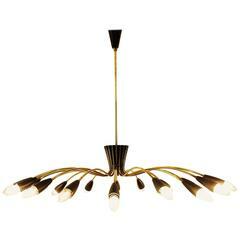 Three-glass pendant chandelier, Italy, circa 1950. 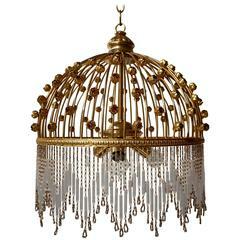 Italian glass and brass chandelier. Diameter: 40 cm. Height: 65 cm. Total height with the chain: 100 cm. Four E14 bulbs. 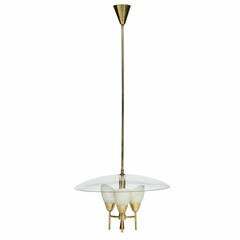 Italian glass and brass pendant light. Diameter: 38 cm. Height: 40 cm. Height with the chain: 105 cm. Three E14 bulbs. Italian glass and brass chandelier. Height fixture:55 cm. Total height with the chain:90 cm. Diameter:55 cm. 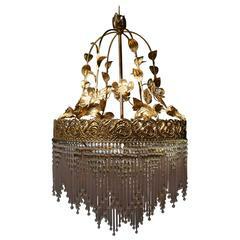 A 1950s Italian patinated brass eight-arm chandelier with large circular patterned glass diffusers. The candle style bulb holders slightly distressed.